ASU team finds mutual respect, mutual learning in Havana. Researchers start to bring Cuba into ASU-led extreme-weather resilience study. President Barack Obama arrived Sunday afternoon in Cuba, the first visit of a sitting American presidentPresident Calvin Coolidge, the 30th president, took his first foreign trip in office to Cuba in January of 1928. Unlike President Obama, who took Air Force One, Coolidge arrived on a battleship. to that country in 88 years. It's an historic trip, occasioned by Obama's major recalibration of American foreign policy toward the Communist island that sits a mere 90 miles from Florida. While there, the president will speak with Cuban President Raul Castro, with business leaders and political dissidents, and he'll take in an exhibition baseball game between Cuba's national team and Major League Baseball's Tampa Bay Rays. Though restoring U.S.-Cuba diplomatic ties after decades of tension could be a rocky road, there are a number of positive signs. A team from ASU got to see some first hand. A 12-person group of Arizona State University researchers spent six days in Cuba in early March, building relationships, demonstrating the university’s strengths in areas Cuban institutions are interested in, and showing ASU’s dedication to developing and sharing knowledge. Unlike North Korea, Cuba is not isolated from the entire globe, said Mikhail Chester. Chinese cars on the street and Chinese consumer goods were testament to that. Delegates weren’t sure how they’d be received or how much progress they would make. Was it going to be a closed-doors situation? Though many Americans have a view of Cuba as a closed nation rooted in the past, the team of Arizona State University researchers found a positive, open welcome and much to learn from their Cuban counterparts. Top photo: The ASU group tours the University of Havana. Ruth Wylie, assistant director of ASU's Center for Science and the Imagination and an assistant research professor in the Mary Lou Fulton Teachers College, speaks at the Cuban Neuroscience Center about imagination as a tool for the development of scientific innovation. At the residence of U.S. Ambassador to Cuba Jeffrey DeLaurentis, the ASU team received a briefing from Tina Onufer, deputy consul general, on behalf of the ambassador. At the Center of Molecular Immunology, the group came across a photo of Che Guevara, a prominent communist figure in the Cuban Revolution, signed by the photographer. "The Cuban government since the revolution has always made science a priority, even in the toughest times for the country," said Marga Gual Soler, who led the ASU trip. Marga Gual Soler presents "Designing the New American University," by ASU President Michael M. Crow, to Sergio Pastrana, foreign secretary of the Academy of Sciences of Cuba. The biggest accomplishment was starting the process to bring Havana into the ASU-led investigation into how cities can survive and bounce back from extreme weather events. Chester and Iwaniec are researchers from the Urban Resilience to Extreme Weather-Related Events Sustainability Research Network (UREx SRNUREx SRN is a unit of the Julie Ann Wrigley Global Institute of Sustainability. ), a team of 50 researchers from 15 institutions led by ASU professors to investigate how cities can better endure storms like Joaquin, Sandy and Katrina. They met with officials from the United Nations Development Programme, a small office in Havana in charge of resilience efforts for all of Cuba. Cuba has issues with coastal and inland flooding, drought and hurricanes. Severely aging infrastructure is another problem. The UN effort has focused on preparing Cuba with coordinating agencies and keeping communication lines open in times of disaster. Cubans the delegation met on the trip really wanted to share information, said Soler, an assistant research professor at the School for the Future of Innovation in Society. She also manages science cooperation projects between Cuba and the U.S. for the Center for Science Diplomacy at the American Association for the Advancement of Science. Cuba’s knowledge of hurricanes and flooding could be a huge benefit to Miami and Puerto Rico. “I see it as a potentially excellent partnership,” Chester said. The team spent a significant amount of time with Sergio Pastrana, foreign secretary of the Academy of Sciences of Cuba, the gatekeeper between all Cuban science partnerships with foreign universities, deepening ties with ASU. Given the political realities of Cuba and the uncertain state of bilateral relations, the delegation chalked up the trip as a success, with Cuba having as much to offer as the university. Answer: This conference was an opportunity for undergraduate students to present individual research in a professional setting. The conference took place at George Washington University in Washington, D.C. There were 67 participants who presented on topics surrounding American politics, comparative politics, and international relations. 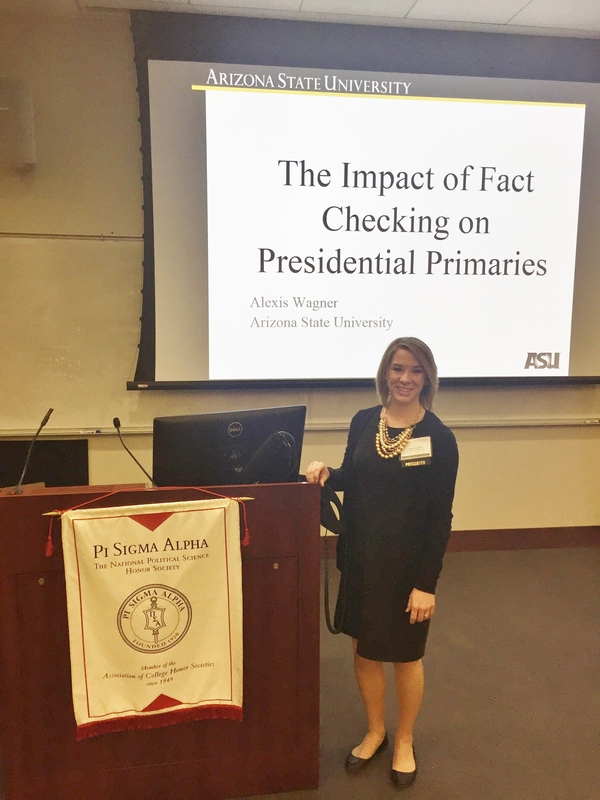 I presented a paper that I wrote based on a group research project ("The Impact of Fact Checking on Presidential Primaries") that was conducted last semester in Dr. Fridkin's POS 503 course. After presenting, each participant received feedback from the panel discussant, and then members of the panel were able to ask questions. It was an amazing experience to get more detailed feedback from someone not involved in the development of the project so that they did not have any bias towards the project. I also loved being asked our reasoning behind some of the project's decisions and also get some ideas on how to make it even better if it were to be continued in the future. This was a great experience that provided me an opportunity to meet other students from across the country and learn from their ideas as well as share my own ideas with them. Q: What did you learn/enjoy the most from your trip? A: What I learned most from my trip was that writing a paper and explaining it in a short 12-minute presentation are completely different. Our project was very detailed and could be confusing, so having a short amount of time to explain everything I needed to was very difficult. I enjoyed the challenge, though, and I am so glad that I had a great set of instructors supporting me and helping me prepare for this experience. I also learned that it is important to take criticism and learn from your mistakes. I saw that students who were not open to criticism on their papers struggled in this conference and that those that accepted the feedback planned to make their papers better so that it will be more likely to succeed in the future. It is important to know that criticism isn't to tear you down, but to help you get better. A: After I graduate in May, I plan to continue my master’s degree that I have already started as part of the 4+1 program. I am not exactly sure what I plan to do after graduation; however, whatever I do I hope to make a difference in the world. When I worked for the Treasury Department last summer I gained a love for working for the federal government and would love to return to that field! Q: How do you think this trip will help you attain your career aspirations? A: This trip helped me realize that political science is trying to explain the world, so being open to new ideas and understanding and findings is an important part of learning about everything that is going on and seeing why it is happening. I think that this trip gave me a new understanding of how important the research that we are doing is and how the findings can be applied to the government so that it can help change our country, and even the world in some cases, for the better. Q: What advice would you give someone who was looking to have a similar trip experience? A: If I were to give someone looking to have a similar trip experience some advice I would tell them to be prepared to receive both positive and negative feedback on their research, but to do something with that feedback. The conference was not just there to tell students how great they were; it was there to help them get better. I think that the most important thing to do if attending this trip is to listen to the feedback and then edit your paper! Doing nothing to your paper and ignoring the feedback after attending the conference limits your potential!